Our two-day journey east from Utah to Colorado for a visit with Monte is the most scenic RV ride I believe we have ever enjoyed. I-70 from Marysvale to Grand Junction carves a route through colorful, rocky landscapes. 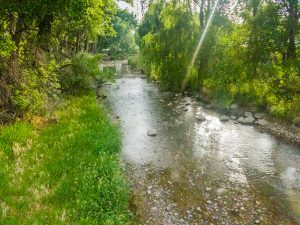 Turning south, we stop overnight at the peaceful, verdant Uncompahgre River RV Park in Olathe where as always they are so very kind to us. An early morning departure puts us on US Hwy 50 and across the 11,312′ Monarch Pass before the air warms up enough to overheat our engine. Why North and over Monarch Pass? We chose this route rather then going south through Durango because it is 100 miles shorter and there are wildfires near the Durango route that we want to avoid. Storm is concerned enough about heat stressing our engine on such a high pass, without also running it through a flaming forest. Since we have to cross a high mountain pass somewhere to get back to Monte’s, Monarch Pass is as good as any I keep telling myself over and over!. I am disappointed that my pre-crossing search for info regarding driving an RV over Monarch Pass yields limited results. There are webcams at the pass summit and from those I can see that at the times I look, there is very little traffic. For other RVers considering this route, here are some tips for crossing. There really was little traffic going east and lots of passing zones for those who chose not to ascend the mountain at our speed of 25mph. I did not notice as many passing zones on the westbound side, but that may be a result of the fact that I rarely took my eyes of the guardrail just below me. There are fewer places to pull over once you start downhill so prepare to be the head of a slow train if you want to save your brakes down the steep grade. According to Monte, NEVER take US 50 through Colorado on a weekend as it is crowded with folks white-water rafting, fishing, and generally enjoying the rivers and reservoirs along this route.